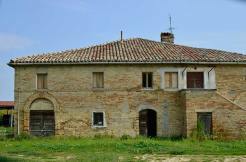 In the old town in the Municipality of Arcevia, a medieval borgo in the Province of Ancona in the backcountry of Senigallia, there is this typical and completely restored house in the tower of the town. As you can understand from its location you can enjoy an adorable panorama over the gentle hilly landscape of the region Marche. The apartment covers a total surface of 125 square meters over three floors. On the ground floor there is a basement room, i.e. the typical “taverna” for the countryside of the region Marche. The rustic basement room could be turned into an additional living room. 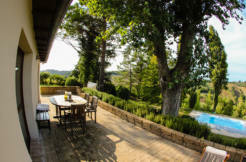 On the middle floor you have a surface of 95 square meters, with a double bedroom and en-suite bathroom, a main bedroom with bathroom, and a third room used as study, a stunning living room used for dining where you can enjoy a beautiful panorama, and a sitting room with a fireplace, a typical feature in every farmhouse of the region Marche, and finally a kitchen. On the upper floor there is a large loft. The ceilings of every room in the house has oak beams and the house is equipped with all necessary services: electricity, public water, methane heating system and also Wi-Fi. The best quality of this apartment is – apart from its unique and eccentric furniture and privileged position – the view over the surrounding landscape and the roofs of the old town, the town walls, the arch of Piticchio up to the bells tower and especially over the stunning countryside with the mountains of Urbino on the background. The small town is located 379 meters above sea level and it is a borgo with ancient history: its town walls are outstanding; the medieval castle from the fifteenth century with its path all around the town is perfectly preserved. Ancona is only few kilometers far and can easily be reached by car, as well as is the seaside of Senigallia and its amusements.